Add colour and personality to your outfit with a pair of semi-precious gemstone earrings. 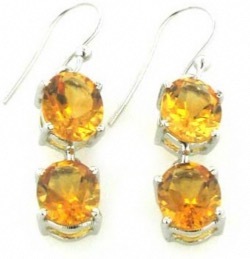 Our collection features gemstone studs, gemstone drops, gemstone dangles, gemstone hoops and gemstone bead earrings. All our gemstone earrings feature natural gemstones. Some are faceted such as our citrine earrings and peridot earrings, others, for example moonstone and labradorite earrings feature cabochons. Each gemstone has its individual character. From the popular purples of amethyst earrings to the sultry sophistication of smokey quartz earrings, there's a pair here for everyone and every occasion. Shop here for semi-precious earrings with free delivery.